[AUTO](VC)[1/Turn]:[Soul Blast (1)-card with the brave ability] When this unit is placed on (VC), or when your G unit Stride, you may pay the cost. If you do, search your deck for up to one card with the brave ability not named “Higher Deity Knight, Altmile”, call it to (RC), and shuffle your deck. 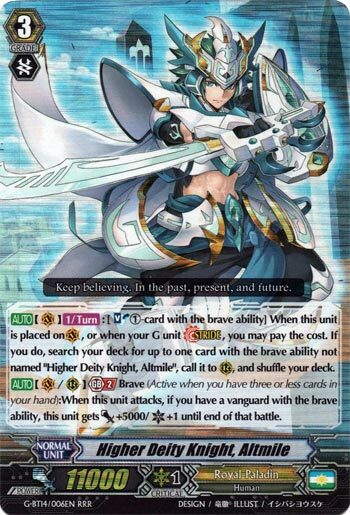 [AUTO](VC/RC) Generation Break 2 Brave (Active when you have three or less cards in your hand):When this unit attacks, if you have a vanguard with the brave ability, this unit gets [Power]+5000/[Critical]+1 until end of that battle. So unlike the first two Altmiles, this one goes for straight plussing instead. Do I think that’s necessarily BETTER? Eh, it certainly works to set up combo pieces, which Brave needs to work seamlessly, but I’d prefer to use the RGs to make a field and use the large columns to make more. However, I will say that I guess it plays into Immortal Fides’s hands a bit better, since small columns eating more shield makes more sense, as large attacks would force 2+ guardians anyway. The GB2 is also much more useful than the other 2 Altmiles before. Biggest letdown is the fact you must Soulblast a Brave to do this, because you can forget about using his Personal Critical to make up for it and basically nothing else in the deck can Soulblast because of this guy’s needs. And new Millius is a bit of a crapshoot. What’s up, Rogue Squad?! Sorry about the hiatus; let’s just say I needed to do some personal changes and am back to how I should be…which is a good thing lol Anyway, back to reviewing. This new Altmile is exactly what Brave decks needed. The free Brave call helps with getting the necessary deck thinning along with constant field presence. The only real drawback is that it’s a special Soulblast for Braves, so no blasting the Altmile Crit or anything like that (though the Brave Crit would be a great choice). Overall, if you’re Brave, then you’re running this at 4.